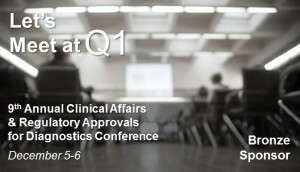 Beaufort is excited to be attending Q1’s 9th Annual Clinical Affairs & Regulatory Approvals for Diagnostics Conference. Are you attending too? If so, contact us today to schedule a time to meet while in Alexandria. Just call 757.383.6019 or email us at [email protected]. The Beaufort team would welcome the opportunity to learn more about your clinical affairs and regulatory needs and the challenges you are facing as we head into 2017.